But what actually is taking place with my LAWN!?!? No matter what turf type you have, somethings need to be avoided. Please minimize the amount of traffic on your lawn. It’s not good for it. 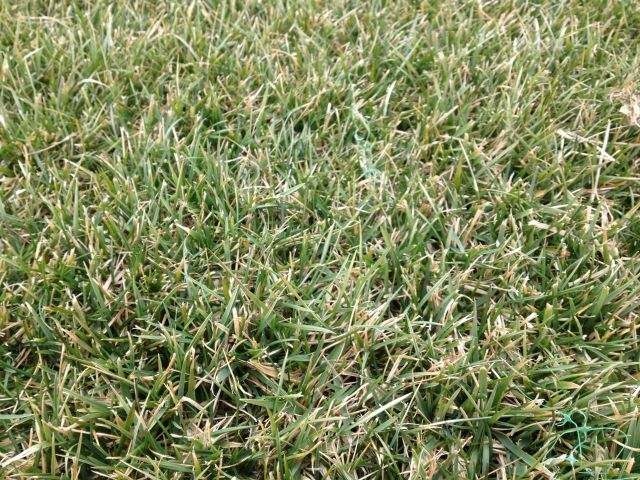 Foot traffic during the freezing temps can be enough to cause damage to the veins of the grass plant – thus eliminate ways to move nutrients and watter necessities. Please, especially, don’t drive on the grass. Thought it’s probably easier to do really awesome donuts this time of year, it’s really really bad for the turf. But what about winterizer fertilizers? I’m not a big fan of the word “winterizer.” Most of our big box stores have turned the word into a marketing campaign as if it’s the end all be all of lawn care. Truth be told, is it important, yes, but to an extent. Avoid making applications of Nitrogen (N) once the cold has set it. Nitrogen amps up chlorophyll production and the amount of water in the leaves of the plant. Yes it does produce a very pretty green. But in the cold months, though it may still give you green color, albeit slowly, it actually is causing harm. You see, N will actually increase respiration (breathing effectively, moreso loss of water through the leaves). And in the cold months, particularly freezing days, water is not readily available to the plant (it’s frozen!). So in turn, the roots try harder and harder to send water to the leaf, thus robbing them of their stored carbohydrates, and overall weakening the root integrity of the plant. TL;DR – Nitrogen applications too late in the season weaken the integrity of the root structure. Potassium is actually the important part of the winterizer fertilizer. In the ratio 16 – 4 – 8, that would be the 8. Known to improve drought resistance. Activation of enzymes – potassium has an important role in the activation of many growth related enzymes in plannts. I don’t recommend grabbing a bag of 0 – 0 – 60 and spreading it on your lawn, but as you can see, potassium plays a vital role in the plant. Instead, let us take a soil sample. We’ll find out exactly what your lawn needs to thrive and devise a plan to get it there!